Unfortunately, unless I travel to the library at the Fashion Institute of Technology, there doesn't seem to be any way for me to examine the actual November 1919 issue of Vogue - only its cover is available online. However, it seems extremely unlikely to me that there are literally pages of it devoted to Chanel. Arrogant of me? Perhaps. In my studies, I have examined many periodicals and fashion plates both in person and online, and one thing that has stood out to me is that, while labeled Chanel designs do turn up here and there, they do not really become a force until the mid-1920s. Even extant gowns with Chanel labels from before 1925 seem scarce-to-nonexistent in museum collections available online. If she were really taking the fashion world by storm in November of 1919, why would she retreat afterward? 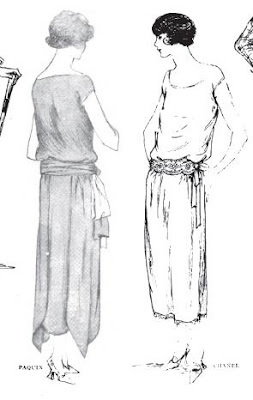 For example, the January 1922 issue of Good Housekeeping devotes several pages to fashion. The first shows Premet and Jenny designs, and mentions both Jenny and Vionnet; the following show more Jenny, Paquin, Lelong, Patou, Germaine, and Alice Bernard garments. Not a Chanel in sight. February takes off with Patou, Lanvin, Paquin; March with Dorat, Alice Bernard, Goupy, Yteb, Paquin, Jenny, Lanvin, Drécoll ... and, at last, Chanel! The May issue does show more Chanel: page 51 has three dress and suit designs, followed by an overblouse. Coming back in June, Paul Caret takes center stage, followed by Lanvin, Drécoll, Paquin, Jenny, Rolande, and Germaine. No Chanel. Looking to another periodical, Harper's Bazaar, also in 1922, one finds similar results. January starts off with several Chéruit ensembles for vacationers, followed by Renée, Worth, Yteb, Chanel, Jenny, a page for Lanvin, more Renée and Jenny, Lelong, Premet, and more Jenny. Chanel's offering is a single sporty day dress. Skipping up to March, Doucet's evening gowns top the first page, followed by Yteb, Molyneux, Jenny, Worth, Premet, Dorat, Patou, Madeleine & Madeleine, Lanvin, Lelong, Chéruit, and Soulie (a two-page spread), with most of these repeated several times. Chanel is relatively rarely represented, although she does appear repeatedly through the whole volume and is praised. * Note that Chanel's "short styles" are hardly what we would consider short -about two inches shorter than the fashionable 1922 length. We invariably look to Callot for the most exquisite of draped gowns, and, invariably, we are not disappointed. Yet notes like these are ignored because nobody is looking to prove that Callot Soeurs changed the face of fashion or was the premier designer of an age. I really enjoy this kind of post. You've done your homework and analysed the issue from more than one point of view. You have not assumed anything. Your conclusions make sense. You are a smart cookie. It's interesting to take historical information and re-examine it. Often what we have taken as gospel just does not hold up to close scrutiny. Thank you so much! I used to go along with the Chanel stuff, but my recent obsession with the late teens and early twenties made me realize how gradual that change was, and then how rare Chanel's name is during that time. Coming across that block of text in the introduction spurred me on to really investigate the nitty-gritty of the claims in favor of her as a catalyst. I need to hug you. Thank you !!! I'm going to share this A LOT. I will hug you back! You're welcome and thank you.